I am often asked what are the Scolio-Pilates References or what are the resources I used to create Scolio-Pilates. That’s similar to asking how did Scolio-Pilates get started? It started because I needed a solution for my own scoliosis and I read a lot. A lot-A lot. And I’m still reading a lot. 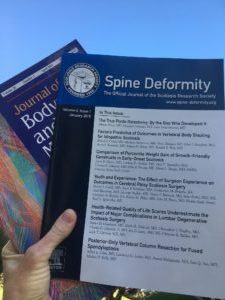 Spine Deformity, The official journal of the scoliosis research society, editor-in-chief, John E. Lohnstein, MD. Journal of Bodywork and Movement Therapies, editor-in-chief, Leon Chaitow, ND, DO. I can’t imagine anyone would want the full list of Scolio-Pilates references. It would be a snoozer. I can however, at least give you a partial list that I use in my Scolio-Pilates Mentorship Manual. Maybe that would help those of you who are doing research into scoliosis exercise. Without a doubt, more research needs to be done on scoliosis exercise, as there is a lack of studies done on this subject. However, don’t take that as meaning as its not effective, take that to mean that more money has been spent on just different kinds of studies, specifically bracing and surgery. In my opinion, that’s fantastic. And I’m also excited about the possibility that there is mostly uncharted territory in the realm of scoliois exercise. And that’s exciting! It’s going where no one has gone before! Our very own Ann Smith, DPT, MS, PCS, the director of physical therapy at Dayton Children’s Hospital, an authorized Scolio-Pilates Center, is in the process of doing a 6-year study about the effects of Scolio-Pilates. There is more and more interest from those in a position to collect data to perform studies about Scolio-Pilates. We are extremely grateful for the dedication that these individuals show to helping those with scoliosis by gathering the information needed. This way, those with scoliosis can make well-informed decisions. At 2-3 studies read each week, times 10-12 years, this list is in no way complete, but it’s a start for you to understand where what the Scolio-Pilates work is based upon. Barrios C, Perez-Encinas C, Maruenda JI, Laguia M. Significant ventilatory functional restriction in adolescents with mild or moderate scoliosis during maximal exercise tolerance test. Spine. 2005, 30 (14): 1610-1615. Bunnell, WP. The natural history of idiopathic scoliosis before skeletal maturity. Spine. 1986, 11 (8): 773-776.
den Boer WA, Anderson PG, v Limbeek J, Kooijman MA. Treatment of idiopathic scoliosis with side-shift therapy: an initial comparison with a brace treatment historical cohort. Eur Spine J. 1999, 8 (5): 406-410. DiRicco PJ, Breed AL, Carlin JI, Reddan WG. Physical work capacity in adolescent patients with mild idiopathic scoliosis. Arch Phys Med Rehabil. 1983, 64 (10): 476-478. Ducongè P. La rèèducation de la scoliose. Mythè ou rèalitè?. Rèsonance Europeennes Du Rachis. 2002, 1229-1236. 10. Durmala J, Dobosiewicz K, Kotwicki T, Jendrzejek H. Influence of asymmetric mobilisation of the trunk on the Cobb angle and rotation in idiopathic scoliosisin children and adolescents. Ortop Traumatol Rehab. 2003, 5 (1): 80-85. Estenne M, Derom E, De Troyer A. Neck and abdominal muscle activity in patients with severe thoracic scoliosis. Am J Respir Crit Care Med. 1998, 158 (2): 452-457. Ferraro C, Masiero S, Venturin A. Effect of esercise therapy on mild idiopathic scoliosis. Europa Medicophysica. 1998, 25-31. 34. Focarile FA, Bonaldi A, Giarolo MA, Ferrari U, Zilioli E, Ottaviani C. Effectiveness of nonsurgical treatment for idiopathic scoliosis. Overview of available evidence. Spine. 1991, 16 (4): 395-401. Hawes, MC. The use of exercises in the treatment of scoliosis: an evidence-based critical review of the literature. Pediatr Rehabil. 2003, 6 (3-4): 171-182. Hawes, MC, Brooks, WJ. Improved chest expansion in idiopathic scoliosis after intensive, multiple-modality, nonsurgical treatment in an adult. Chest. 2001, 120 (2): 672-674. Hawes, MC, Brooks WJ. Reversal of the signs and symptoms of moderately severe idiopathic scoliosis in response to physical methods. Stud Health Technol Inform. 2002, 91: 365-368. Kafer, ER. Idiopathic scoliosis. Mechanical properties of the respiratory system and the ventilatory response to carbon dioxide. J Clin Invest. 1975, 55 (6): 1153-1163. Kennedy JD, Robertson CF, Hudson I, Phelan P. Effect of bracing on respiratory mechanics in mild idiopathic scoliosis. Thorax. 1989, 44 (7): 548-553. Kesten S, Garfinkel SK, Wright T, Rebuck AS. Impaired exercise capacity in adults with moderate scoliosis. Chest. 1991, 99 (3): 663-666. Klisic P, Nikolic Z. Scoliotic attitudes and idiopathic scoliosis. Proceedings of the International Congress on Prevention of Scoliosis in Schoolchildren. 1985, Milan: Edizioni Pro-Juventute, 1: 91-92. Kotani T, Minami S, Takahashi K, Isobe K, Nakata Y, Takaso M, Inoue M, Maruta T, Akazawa T, Ueda T. An analysis of chest wall and diaphragm motions in patients with idiopathic scoliosis using dynamic breathing MRI. Spine. 2004, 29 (3): 298-302. Kotani T, Minami S, Takahashi K, Isobe K, Nakata Y, Takaso M, Inoue M, Nishikawa S, Maruta T, Tamaki T. Three dimensional analysis of chest wall motion during breathing in healthy individuals and patients with scoliosis using an ultrasonography-based system. Stud Health Technol Inform. 2002, 91: 135-139. Lenssinck ML, Frijlink AC, Berger MY, Bierman-Zeinstra SM, Verkerk K, Verhagen AP. Effect of bracing and other conservative interventions in the treatment of idiopathic scoliosis in adolescents: a systematic review of clinical trials. Phys Ther. 2005, 85 (12): 1329-1339. Leong JC, Lu WW, Luk, KD, Karlberg, EM. Kinematics of the chest cage and spine during breathing in healthy individuals and in patients with adolescent idiopathic scoliosis. Spine. 1999, 24 (13): 1310-1315. Lisboa C, Moreno R, Fava M, Ferretti R, Cruz E. Inspiratory muscle function in patients with severe kyphoscoliosis. Am Rev Respir Dis. 1985, 132 (1): 48-52. Lonstein, JE. Natural history and school screening for scoliosis. Orthop Clin North Am. 1988, 19 (2): 227-237. Mamyama T, Kitagawal T, Takeshita K, Nakainura K. Side shift exercise for idiopathic scoliosis after skeletal maturity. Stud Health Technol Inform. 2002, 91: 361-364. Martinez-Llorens J, Ramirez M, Colomina MJ, Bago J, Molina A, Caceres E, Gea J. Muscle dysfunction and exercise limitation in adolescent idiopathic scoliosis. Eur Respir J. 2010, 36 (2): 393-400. McIntire, K, Asher, M, Burton, D, Liu ,W. Trunk rotational strength training for the management of adolescent idiopathic scoliosis (AIS). Stud Health Technol Inform. 2006, 123: 273-280. Mooney, V, Gulick, J, Pozos, R. A preliminary report on the effect of measured strength training in adolescent idiopathic scoliosis. J Spinal Disord. 2000, 13 (2): 102-107. Morningstar, MW, Woggon D, Lawrence G. Scoliosis treatment using a combination of manipulative and rehabilitative therapy: a retrospective case series. BMC Musculoskelet Disord. 2004, 5: 32. Negrini, S. Approach to scoliosis changed due to causes other than evidence: patients call for conservative (rehabilitation) experts to join in team orthopedic surgeons. Disabil Rehabil. 2008, 30 (10): 731-741. Negrini, S, Antonini, G, Carabalona, R, Minozzi, S. Physical exercises as a treatment for adolescent idiopathic scoliosis. A systematic review. Pediatr Rehabil. 2003, 6 (3-4): 227-235. Negrini, S., Atanasio, S., Fzaina, F., Romano, M. Rehabilitation of adolescent idiopathic scoliosis: results of exercises and bracing from a series of clinical studies. Europa Medicophysica-SIMFER 2007 Award Winner. Eur J Phys Rehabil Med. 2008, 44 (2): 169-176. Negrini, S., Fusco, C., Minozzi, S., Atanasio, S., Zaina, F., Romano, M. Exercises reduce the progression rate of adolescent idiopathic scoliosis: results of a comprehensive systematic review of the literature. Disabil Rehabil. 2008, 30 (10): 772-785. Negrini, S., Negrini, A., Romano, M., Verzini, N., Parzini, S. A controlled prospective study on the efficacy of SEAS.02 exercises in preventing progression and bracing in mild idiopathic scoliosis. Stud Health Technol Inform. 2006, 123: 523-526. Negrini, S., Zaina, F., Romano, M., Negrini, A., Parzini, S. Specific exercises reduce brace prescription in adolescent idiopathic scoliosis: A prospective controlled cohort study with worst-case analysis. J Rehabil Med. 2008, 40 (6): 451-455. Pehrsson, K., Bake, B., Larsson, S., Nachemson, A. Lung function in adult idiopathic scoliosis: a 20 year follow up. Thorax. 1991, 46 (7): 474-478. Pehrsson, K., Nachemson, A., Olofson, J., Strom, K., Larsson, S. Respiratory failure in scoliosis and other thoracic deformities. A survey of patients with home oxygen or ventilator therapy in Sweden. Spine. 1992, 17 (6): 714-718. Refsum, H.E., Naess-Andresen, C.F., Lange, J.E. Pulmonary function and gas exchange at rest and exercise in adolescent girls with mild idiopathic scoliosis during treatment with Boston thoracic brace. Spine. 1990, 15 (5): 420-423. Rigo, M., Quera-Salva, G., Puigdevall, N. Effect of the exclusive employment of physiotherapy in patients with idiopathic scoliosis. Proceedings Book of the 11th International Congress of the World Confederation for Physical Therapy. London. 1991, 3: 1319-1321. Shneerson, J.M. Cardiac and respiratory responses to exercise in adolescent idiopathic scoliosis. Thorax. 1980, 35 (5): 347-350. Shneerson, J.M., Madgwick, R. The effect of physical training on exercise ability in adolescent idiopathic scoliosis. Acta Orthop Scand. 1979, 50 (3): 303-306. Smania, N., Picelli, A., Romano, M., Negrini, S. Neurophysiological basis of rehabilitation of adolescent idiopathic scoliosis. Disabil Rehabil. 2008, 30 (10): 763-771. Smyth, R.J., Chapman, K.R., Wright, T.A., Crawford, J.S., Rebuck, A.S. Ventilatory patterns during hypoxia, hypercapnia, and exercise in adolescents with mild scoliosis. Pediatrics. 1986, 77 (5): 692-697. Soucacos, P., Zacharis, K., Soultanis, K., Gelalis, J., Kalos, N., Beris, A., Xenakis, T., Johnson, E. Assessment of curve progression in Idiopathic Scoliosis. European Spine Journal. 1998, 7: 270-277. Stoboy, H., Speierer, B. [Pulmonary function tests and spiroergometric parameters during rehabilitation of patients with idiopathic scoliosis (fusion of the spine with Harrington rod and training) (author’s transl)]. Arch Orthop Unfallchir. 1975, 81 (3): 247-254. Stone, B., Beekman, C., Hall, V., Guess, V., Brooks, H.L. The effect of an exercise program on change in curve in adolescents with minimal idiopathic scoliosis. A preliminary study. Phys Ther. 1979, 59 (6): 759-763. Takahashi, S., Suzuki, N., Asazuma, T., Kono, K., Ono, T., Toyama, Y. Factors of thoracic cage deformity that affect pulmonary function in adolescent idiopathic thoracic scoliosis. Spine (Phila Pa 1976). 2007, 32 (1): 106-112. Wan, L,. Wang, G-x., Bian, R. Exercise therapy in treatment of essential S-shaped scoliosis: evaluation of Cobb angle in breast and lumbar segment through a follow-up of half a year. Zhongguo Linchuang Kangfu (Chinese Journal of Clinical Rehabilitation). 2005, 9 (34): 82-84. Weiss, H.R., Maier-Hennes, A. Specific exercises in the treatment of scoliosis–differential indication. Stud Health Technol Inform. 2008, 135: 173-190. Weiss, H.R., Weiss, G. Meta Analysis of Prevalence of Surgery in Patients with Scoliosis Following Conservative Treatment. International Research Society on Spinal Deformities: 2004; Vancouver. 2004, 416-419.